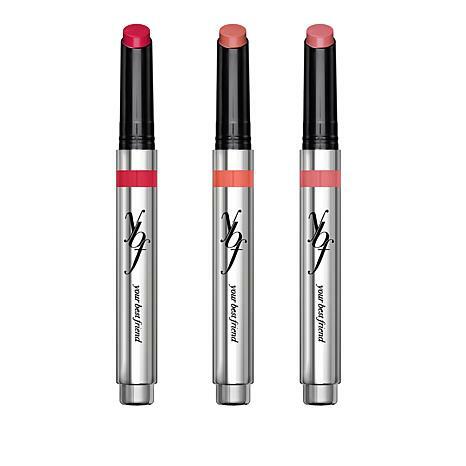 A lovely clickable lipstick that locks on to your lippies like a sweet smooch. Ingredients: Diisostearyl Malate, Caprylic/Capric Triglyceride, Polyglyceryl-2 Triisostearate, Bis-Diglyceryl Polyacyladipate-2, Hydrogenated Polydecene, Polyethylene, Polyisobutene, Tridecyl Trimellitate, Microcrystalline Wax, Synthetic Beeswax, C10-18 Triglycerides, Simmondsia Chinensis (Jojoba) Seed Oil, Polyhydroxystearic Acid, Phenoxyethanol, Octanediol, Parfum (Fragrance), Tocopherol, Lecithin, Ascorbyl Palmitate, Glyceryl Stearate, Glyceryl Oleate, Citric Acid. May Contain (+/-): Titanium Dioxide (CI 77891), Iron Oxides (Cl 77491, CI 77492), D&C Red No.7 (CI 15850), FD&C Blue No. 1 (CI 42090), FD&C Yellow No.5 (CI 19140), D&C Red No. 6 (CI 15850).